As you no doubt know by now, Friday marks the day that the EU’s GDPR becomes enforceable. This means that there are certain rules you will be required to follow if you collect or process data from European customers. 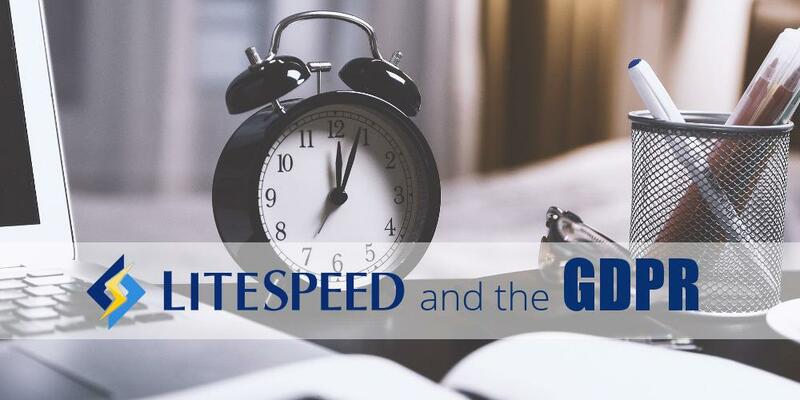 If you are a LiteSpeed customer, you can expect that we will collect only as much information from you as is necessary to provide you with our software, licenses and any technical support you may request. We don’t currently share your data with third parties, and we have no plans to do so in the future. However, if this changes, we will update our policy and keep you informed. If you have provided sensitive information (login credentials, etc.) while working with our support team, please know that we consider such data to be strictly confidential and we delete it from our system as soon as we close the ticket. We have the ability to comply with any of the rights that are granted to you under the GDPR, if you should wish to exercise them. Our software does not directly process any personally identifiable information from visitors to your site. Nevertheless, LiteSpeed may be considered a data processor, as your users’ information may be temporarily cached and/or logged. LiteSpeed server stores any cache or log files locally on the system where you have installed the software. Our employees never access the files in any way, except as necessary in providing routine technical support if you request it. The cache and log files are always under your control. You have the ability to decide how long (or if) to keep such files, and to delete them on demand.